Carrots can be eaten in a variety of ways. Raw carrots should be thoroughly washed: raw vegetables may carry harmful bacteria or parasites. 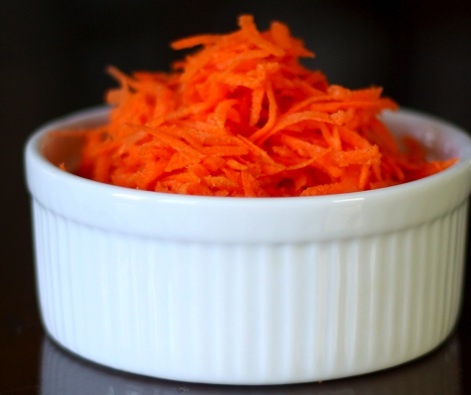 Only 3% of the carotene in raw carrots is released during digestion. This can be improved to 39% by pulping, cooking and adding cooking oil. Carrots may be chopped and boiled, fried or steamed, and cooked in soups and stews. A well known dish is Carrots Julienne. Grated carrots are used in carrot cakes, as well as carrot puddings, an old English dish thought to have originated in the early 1800s. 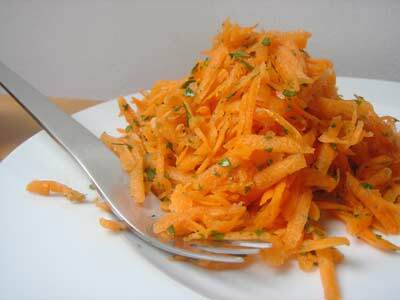 The French invented Carottes Rapées, finely grated carrots simply dressed with lemon (see below). Together with onion and celery, carrots are one of the primary vegetables used in a mirepoix to make various broths. Carrot juice is a health drink, either stand-alone or blended with fruits and other vegetables. 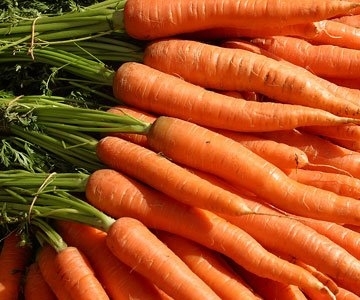 The carrot gets its characteristic and bright orange color from carotene, which is metabolised into vitamin A in humans when bile salts are present in the intestines. Massive overconsumption of carrots can cause carotenosis, a benign condition in which the skin turns orange. Carrots are also rich in dietary fibre, antioxidants, and minerals.For more information see http://en.wikipedia.org/wiki/Carrot. Carottes Rapées is simply grated carrots tossed in fresh lemon juice, a bit of salt, and sometimes a little olive oil. You can add some chopped flat-leaf parsley, but nothing more. It is important that the carrots are very thinly grated. I prefer to use my Kitchen Aid mixer with the fine grater attachment. Buy carrots in bulk. I always peel mine before running them through the juicer.